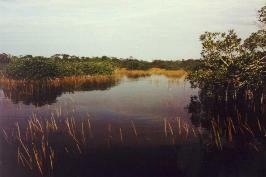 Only a few miles from Homestead is the south entrance to Everglades National Park. A friend and I canoe the "Nine-mile Pond Trail" (see photo of the Trail) after hearing that some of the other trails are infested with mosquitoes (we encounter none, amazingly, on Nine-mile). The trail is very pleasant. The marshes are beautiful. Through much of it, you paddle through "spike rushes"-a form of tall marsh grass-which gives you the feeling of canoeing through a field of grass. We see no people along the way, nor are there signs of any buildings, power lines, or planes. The silence is impressive and relaxing. Strangely, even though we embark at 8:30 a.m., we see only a few wading birds and no other wildlife. I guess we need to be out there closer to dawn or dusk next time. And there WILL be a next time. On the map we are given, I notice something called the "Wilderness Trail." It is 99 (!!!!!!) miles long, passing through the heart of the Everglades from north end to south end. It takes seven days by canoe, with primitive camp sites along the way. What an adventure!! The park is 1,507,000 acres, including 1,297,000 acres of wilderness. It was established in 1947, and is both a Biosphere Reserve and a World Heritage site. It is the largest remaining subtropical wilderness in the coterminous U.S. The Everglades is an incredible experience. It is often called a "river of grass" because, technically, it is a freshwater river 50 miles wide but only six inches deep.